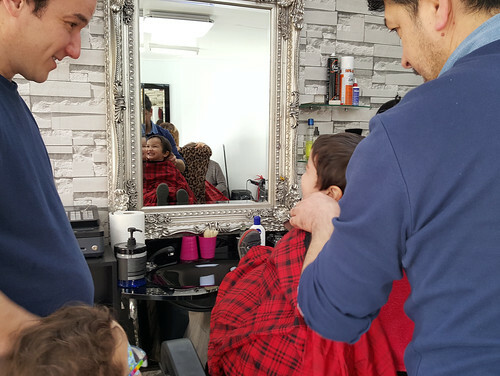 Keiki in the barber's chair, reflected in the mirror grinning with glee as the bloke and Humuhumu look on and the barber wraps him in a red checked cloth. This weekend, Keiki had his first haircut. 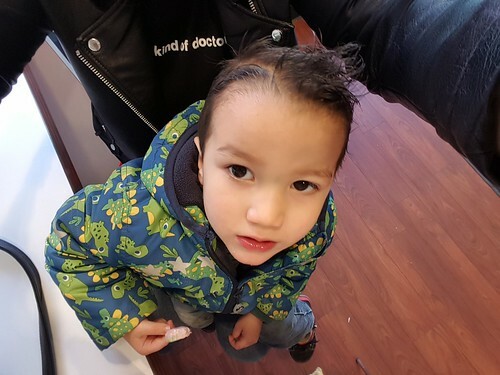 Well, his first haircut that was not administered by Daddy and/or Mummy. It was by far the best hair-cutting experience he's ever had. There were no tears, there was no screaming and he did everything the barber asked him to. He really enjoyed it, and not just because he was promised a lolly by the barber at the end. I am immensely relieved that I will never again have to wield a pair of sharp scissors next to his ears while he howls his lungs out. Check out this cool dude and his spiky gelled 'do. This entry was originally posted at https://nanila.dreamwidth.org/1136846.html. The titration count is at .0 pKa. I don't think Pod will ever let a barber cut his hair. He's 2 and he's had a couple of trims by my parents. They have to distract him to do it. Haha. Maybe when he's older he'll grow out of it! Aw. I hope he does. Keiki is 3 years 3 months now so it might be an age thing. Certainly we weren't inclined to try it any earlier! ....Do you know, it never occurred to us to try cutting his hair when he was asleep. That would have been so much easier. Bad scientists; no biscuit! I will say, the cutting hair while sleeping approach had certain drawbacks, so you weren't missing out on much. It eliminated the screaming and flailing, but he most definitely went around looking like his hair had been cut by monkeys, because we couldn't see what we were doing, really. Hilariously, the kid who could not be bribed or cajoled into a haircut as a toddler would be going to get his hair cut every two weeks now if I didn't tell him he needed to wait at least a month between haircuts. Aw, thank you! He was very proud of his haircut when he went to preschool on Monday. Your barber shop visits seem pretty excellent from the photos. Also your hair looks sharp! Yay ... great to hear it went well - and he looks very spiffy! Makes you wish you had gone to the barber sooner? Thanks! Yeah, it does. I think we probably could have started going about six to eight months ago, which is when we were first able to properly reason with him verbally.